Urban Access is a program designed to provide an opportunity for Aboriginal people living in urban areas to access and explore traditional and contemporary Aboriginal art forms and materials. The intergenerational participants will reflect a diverse representation of our urban Aboriginal community. The program focuses on developing, promoting and perpetuating cultural material practice and technical skills. Participants will explore and apply their own cultural context to the design of their projects. 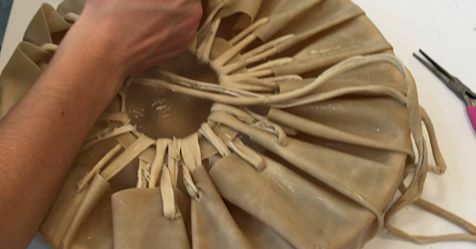 The tangible outcomes include a diverse range of objects created from traditional and contemporary materials including : Drum Making, Cedar Basketry, Beadwork, Moose Hair Tufting, and Printmaking. Urban Access will be hosted in the Emily Carr Aboriginal Gathering Place and is dedicated to promoting Aboriginal identity in a respectful, safe, and culturally welcoming venue that reflects Aboriginal philosophies and values. Applications are open to Aboriginal applicants aged 15 and over. Applications can be emailed (msound@ecuad.ca) or faxed ((604) 844-3089) by May 15, 2019. The Indigenous Matriarch 4 Lab housed at Emily Carr University plans to continue providing VR/AR/360 Workshops free for Indigenous participants over the spring/summer months. For more details on upcoming events and workshops email im4@ecuad.ca to join the mailing list. IM4 intends to provide Augmented-Reality focused workshops this upcoming May. Watch out for the IM4 newsletter highlighting achievements, Indigenous artists, and media creators in VR/AR/360. A 1996 ECU graduate and member of the Kwakwaka’wakw First Nations, Vancouver Island-based artist and advocate Marianne Nicolson will be presented with the Emily Award, an annual honour to acknowledge outstanding achievements by distinguished university alumni. An internationally exhibited artist and outspoken advocate for Indigenous land rights, Nicolson explores traditional Northwest Coast artistic expressions through contemporary media. Her multi-disciplinary practice encompasses photography, painting, carving, video, installation, writing and speaking. Exhibited in the 17th Biennale of Sydney, Australia, Vancouver Art Gallery, the National Museum of the American Indian in New York, Nuit Blanche in Toronto, and many others, many of Nicolson’s works are monumental in size and scope. Her public artworks are currently on display around the world, in the Vancouver International Airport, the Canadian Embassy in Amman, Jordan and the Canadian Embassy in Paris, France. Lawrence Paul Yuxweluptun Lets’lo:tseltun, an artist and ECU alum of Coast Salish and Okanagan descent will be recognized at Emily Carr University’s spring convocation for his inimitable contributions to contemporary art. Lauded for artistic works that are at once challenging, political, confrontational, and playful, Lawrence Paul Yuxwelupton Lets’lo:tseltun will be presented with an Honorary Doctor of Letters for his artistic creations, activism, and unique and persistent voice for change. A painter, sculptor, virtual reality and performance artist, Yuxwelupton Lets’lo:tseltun has spent the past three decades exploring issues of colonization, politics and the environment. He graduated from Emily Carr University in 1983 with an honours degree in painting and uses surrealism, formline, ovoid forms and neon-bright colours to compel viewers to examine issues through a different lens. 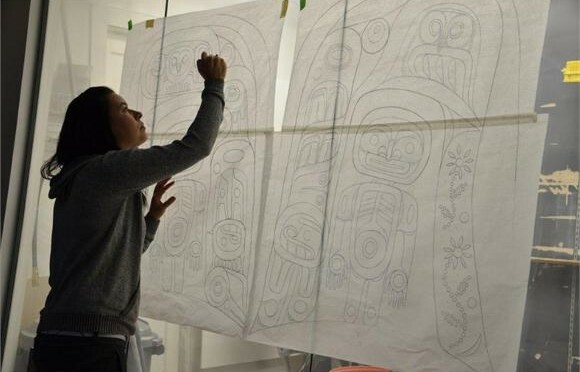 Yuxwelupton Lets’lo:tseltun’s work has been displayed in many international group and solo exhibitions, including the National Gallery of Canada. In 2016, Vancouver’s Museum of Anthropology presented Unceded Territories, a hugely successful retrospective exhibition spanning his expansive 30-year art career. 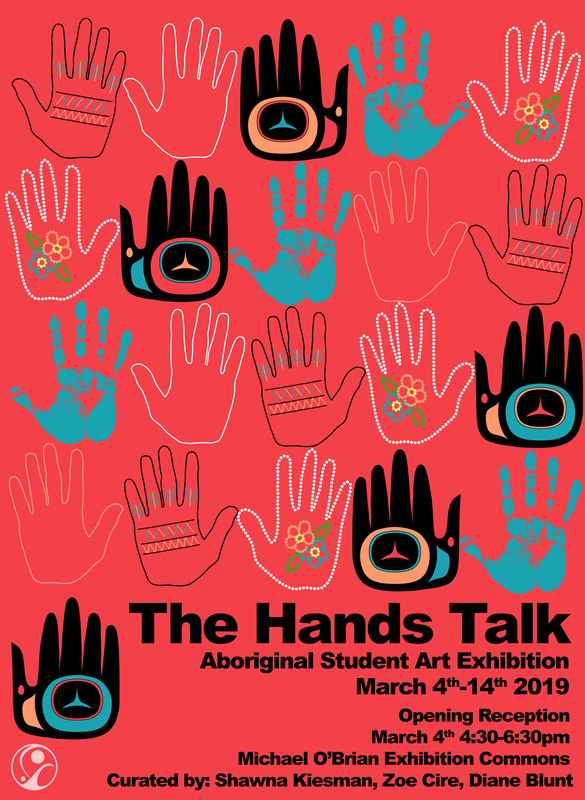 Michelle Sound, Program Assistant for the Aboriginal Gathering Place at Emily Carr, is presenting a solo show at the Amelia Douglas Gallery at Douglas College. Chapan Snares Rabbits is a collection of nine pieces inspired the artist’s heritage and includes dyed deer hide drums painted with gouache and metallic paint, as well as other mixed media works created with canvas, wood and acrylic paint. “Chapan is a Cree word that means your great-grandparents and also means your descendants. My chapan was a midwife and healer who further supported her family with a trapline of rabbit snares. I am inspired by the many Indigenous women who continue to adapt, create and remain the backbone of our families and communities,” said Sound. “Michelle Sound’s beautiful, thoughtful pieces function on a few levels: as expressions of family history and identity, as contemporary examples of traditional craft, and as explorations of the cultural and historical roles of both Indigenous women, and the craft materials themselves,” said Krista Eide, arts events officer at Douglas College. 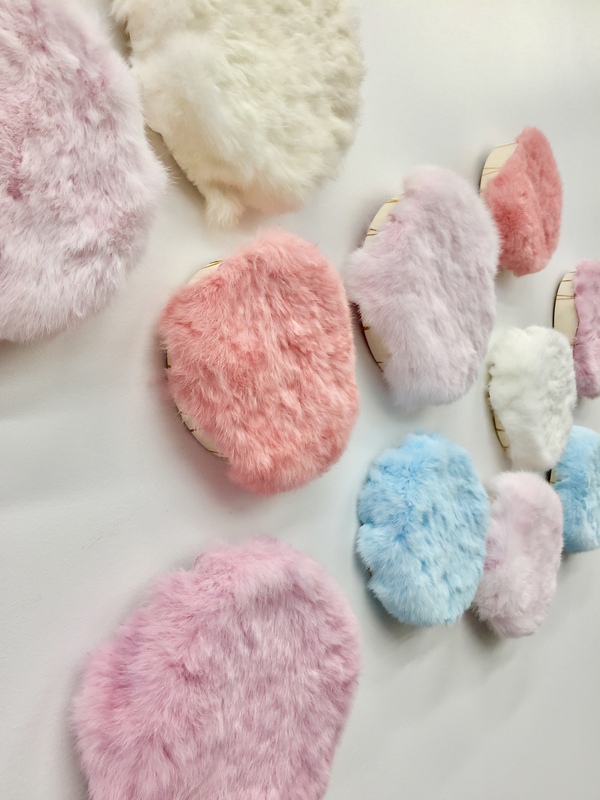 An opening reception for Chapan Snares Rabbit will be held in the Amelia Douglas Gallery on February 28, and an artist’s talk will be held on March 5 at 6:30pm. The IM4 Indigenous VR Speakers Series is an open event. It will be held in the Reliance Theatre at Emily Carr University’s new campus. There will be a light reception at the end provided by Salmon n’ Bannock with DJ Young Dene. It will be an evening of talks given by amazing Indigenous media creators who are utilizing and embracing these new VR/360 technologies for storytelling, artistic and cultural expression. The Series Speakers will include talks from the Indigenous 4 Matriarchs: Loretta Todd, Tracey Kim Bonneau, Doreen Manuel, and Cease Wyss. Our other guest speakers will include Lawrence Paul Yuxweluptun, Zoe Hopkins, Casey Koyczan, and Moni Garr. Indigenous Matriarch 4 Media Lab was brought together by Creative Director Loretta Todd alongside media matriarchs: Cease Wyss, Doreen Manuel, Amethyst First Rider, and Tracey Kim Bonneau. IM4 Media Lab is in partnership with Emily Carr University. IM4 offers workshops for Indigenous artists, storytellers, producers, media creators, and community members to learn about XR, gain technical training, and develop skills to create their own VR/AR and 360 video productions. Adrian Stimson is a member of the Siksika (Blackfoot) Nation. He has a BFA with distinction from the Alberta College of Art and Design and MFA from the University of Saskatchewan. He considers himself as an interdisciplinary artist; he exhibits nationally and internationally. His paintings are primarily monochromatic, they primarily depict bison in imagined landscapes, they are melancholic, memorializing, and sometimes whimsical, they evoke ideas cultural fragility, resilience and nostalgia. The British Museum recently acquired two paintings for their North American Indigenous collection. His performance art looks at identity construction, specifically the hybridization of the Indian, the cowboy, the shaman and Two Spirit being. Buffalo Boy, The Shaman Exterminator are two reoccurring personas. He is also known for putting his body under stress, in White Shame Re-worked, he pierced his chest 7 times, recreating a performance originally done by Ahasiw-Muskegon Iskew, crawled across the desert in 110 degree heat for What about the Red Man? For Burning Man’s The Green Man and recently dug a TRENCH in a five-day durational performance sunrise to sunset. This talk is presented by the Audain Faculty of Art and the Aboriginal Gathering Place. Opening Celebration – March 4th 4:30 p.m.
artworks that thereupon catalyze conversation, emotion and the sharing of knowledge. communities as Indigenous artists, each echoing a distinct acknowledgement of home. speak a language fusing our hand made stories. Spaces for Reading brings together works by Ann Beam and Carl Beam, two artists that question the construction of history and knowledge through systems of classification and representation with post-colonial, feminist and ecological lenses. The works are from two series held in the SFU Art Collection and demonstrate the ways in which these artists informed one another: in their shared life together, through artistic methodologies and with subjects that critique structures of power and ideas of progress while underpinning notions of time and space. Within the exhibition, the gallery will host a reading room with texts selected in response to Ann Beam and Carl Beam’s work by poet Mackenzie Ground and by artist Sandra Semchuk in collaboration with writer Richard Hill. Like the works that surround it, the space for reading is anachronistic, challenging a linear historical perspective and dominant research methods. Reading lists will be available to take away. Richard Hill is Canada Research Chair in Indigenous Studies at Emily Carr University of Art and Design. His column Close Readings, featuring extended reviews of contemporary Indigenous art, ran in Fuse and C Magazine. He also has an irregular column at canadianart.ca. He is currently on the editorial board of the journal Third Text. We are very pleased to present artist Joi Arcand! Joi T. Arcand is an artist from Muskeg Lake Cree Nation, Saskatchewan, Treaty 6 Territory, currently residing in Ottawa, Ontario. She received her Bachelor of Fine Arts degree with Great Distinction from the University of Saskatchewan in 2005. Recent solo exhibitions include Walter Phillips Gallery (Banff, AB); ODD Gallery (Dawson City, Yukon); Mendel Art Gallery (Saskatoon); Wanuskewin Heritage Park (Saskatoon); Dunlop Art Gallery (Regina); Gallery 101 (Ottawa). Her work has been included in numerous group exhibitions, including at the Winnipeg Art Gallery; Karsh-Masson Art Gallery (Ottawa); McMaster Museum of Art (Hamilton, ON); The Center for Craft, Creativity and Design (Asheville, North Carolina); Woodland School at SBC Gallery of Contemporary Art (Montreal); Ottawa Art Gallery; PAVED Arts (Saskatoon); and grunt gallery (Vancouver). Arcand has been artist in residence at Wanuskewin Heritage Park (Saskatoon); OCAD University; Plug-In Institute of Contemporary Art; the Banff Centre for Arts and Creativity; and Klondike Institute of Art and Culture (Dawson City, Yukon). 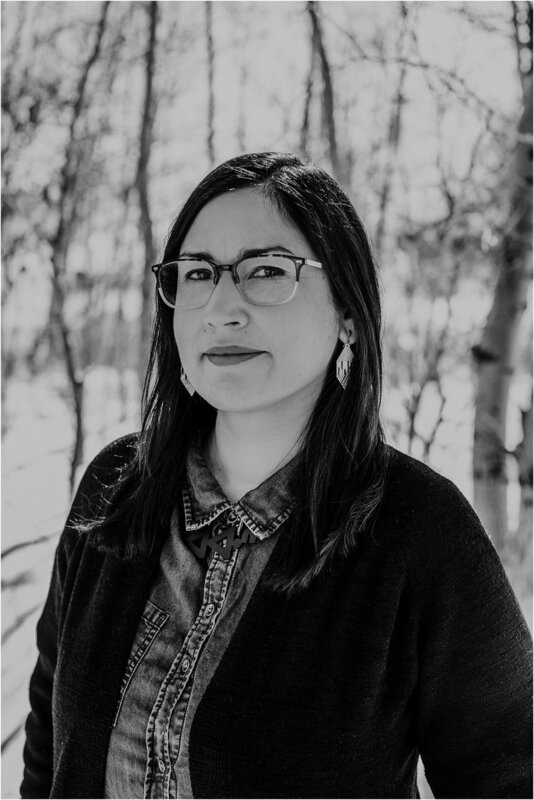 She has served as chair of the board of directors for PAVED Arts in Saskatoon and was the co-founder of the Red Shift Gallery, a contemporary aboriginal art gallery in Saskatoon. She was founder and editor of the Indigenous art magazine, kimiwan (2012-2014), and most recently curated Language of Puncture at Gallery 101 (Ottawa).